Enter MAKE Magazine's Green Project Contest! Enter MAKE Magazine’s Green Project Contest! This December Make magazine is asking you to submit all your awesome green projects in their killer Green Project Contest running all this month. Where creativity knows no bounds, Make will be accepting any projects that you’ve already made – or if you’re a bit of a slacker – something that you’ve been thinking about making, but just hadn’t found the right opportunity to start yet. 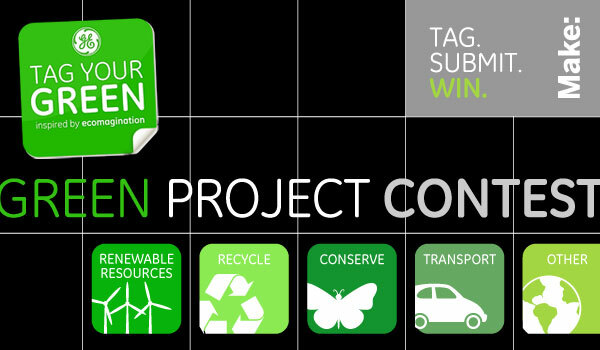 Entrants are encouraged to submit projects that are inspiring, innovative, unique, and above all environmentally-friendly. Bonus points will be given to projects that could have a real-world impact or promote awareness about today’s environmental problems. All of Make’s choice projects will be posted on the site and put to vote by the people, and winners are eligible for some amazing prizes, including grand prize being a trip to a Maker Faire of their choosing (Bay Area, Detroit or New York)! For more details and to enter the contest, click here. The deadline to enter is December 31st! This December Make magazine is asking you to submit all your awesome green projects in their killer Green Project Contest running all this month. Where creativity knows no bounds, Make will be accepting any projects that you’ve already made - or if you’re a bit of a slacker - something that you’ve been thinking about making, but just hadn't found the right opportunity to start yet. Entrants are encouraged to submit projects that are inspiring, innovative, unique, and above all environmentally-friendly. Bonus points will be given to projects that could have a real-world impact or promote awareness about today's environmental problems. All of Make’s choice projects will be posted on the site and put to vote by the people, and winners are eligible for some amazing prizes, including grand prize being a trip to a Maker Faire of their choosing (Bay Area, Detroit or New York)! For more details and to enter the contest, click here. The deadline to enter is December 31st!